Interim Dean Cindy Buys will move your admission in a special ceremony at the Supreme Court on Monday, April 1, 2019. To celebrate this occasion, a breakfast will take place the morning of Monday, April 1, 2019, at the Supreme Court of the United States in Washington, D.C.
You will be responsible for making your own travel arrangements to Washington, D.C., and per the Supreme Court, you may bring one guest into the Courtroom to observe the ceremony. Spaces are limited and will be filled on a first-come, first-served basis. If you would like to participate in this event, please contact Michele Tourville at 618/453-8761 or tville@siu.edu. • Completed application (download application and instructions at www.supremecourt.gov/bar/baradmissions.aspx). We have sponsors for you, or you may obtain your own. 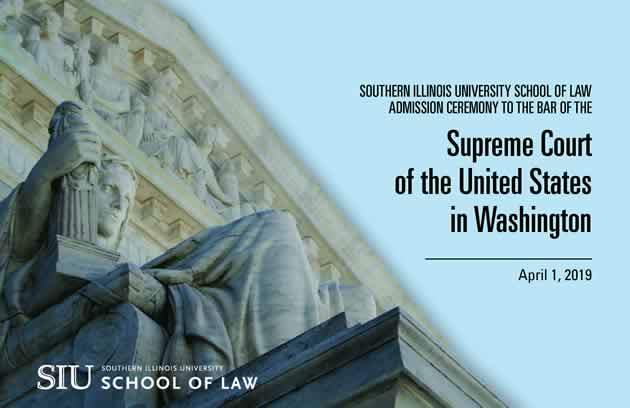 • A check for $250 payable to the SIU School of Law which covers the $200 admission fee charged by the Supreme Court of the United States and $50 to cover breakfast and processing fees incurred by the SIU School of Law. Your check will not be processed until April 2019. • An original certificate of good standing from the highest court of the state in which you have been admitted to practice for at least three years. See previous years swearing-in photos here.